[ Geological Society of London, 1876; Charles Lyell ] John Evans, FRS, President of the Society. London: Printed by Taylor and Francis, 1876. Title continued: [...] Prefaced by the Announcement of the award of the Wollaston Medal [...] The Murchison Medal [...] and the Lyell Medal and Fund [...]. pp., 8vo, lacking blue front wrap, remnants of binding in miscellaneous volume of pamphlets at spine, title sl. sunned, otherwise good condition. It includes a lengthy obituary of Charles Lyell who had died the previous year. Scarce: copies held by copywright libraries and Columbia. [ Thomas McKenny Hughes, Woodwardian Professor of Geology, Cambridge University. ] 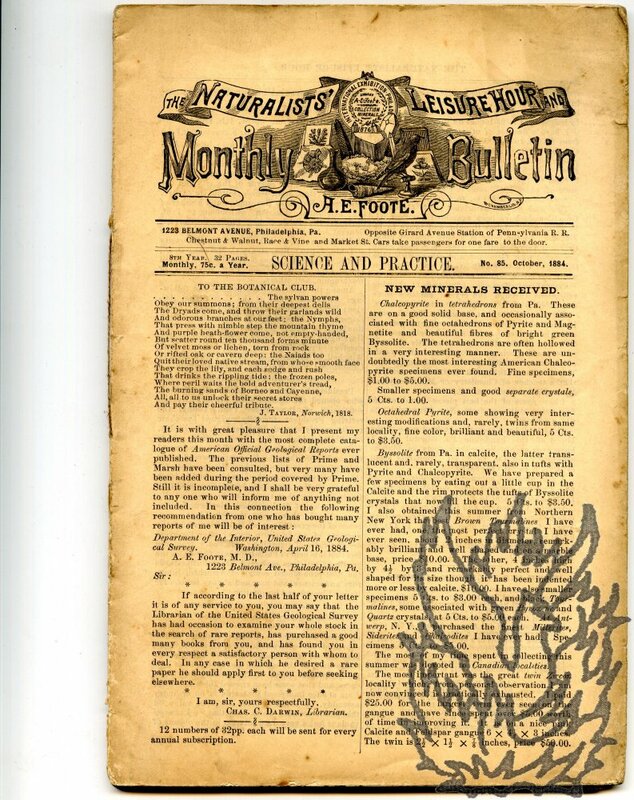 Six issues of a humorous juvenile manuscript periodical by a family member, titled 'The Hillclere Gazette', with several articles on the Sedgwick Museum. Cambridge. 10 and 21 September and 25 December 1899. 2 and 12 and 20 January 1900. Thomas McKenny Hughes was the son of Rev. Joshua Hughes and his wife Margaret, daughter and of Sir Thomas McKenny, Lord Mayor of Dublin. He entered Trinity College, Cambridge, in 1853 (B.A., 1857), and joined the Geological Survey in 1861. He was Woodwardian Professor of Geology, Cambridge University, 1873-1917, and was elected a Fellow of the Royal Society in 1889. He was the prime mover behind the creation of the Sedgwick Museum in Cambridge. In November 1882 he married Mary Caroline Weston, daughter of Canon G. F. Weston. [Printed heading] St John's College, Cambridge, 3 June 1880. Two pages, 12mo, bifolium, some foxing, text clear and complete. His current engagements mean he can't accept hospitality. As regards the boulder either [?] Mathers or the Rev. H.W. Crossley of Birmingham would be able to tell you whether it were a mass of Criffel or Eskdale granite. Sometimes also rocks stray from the Charnwood Forest region - Has Mr T.N. Hutchinson of Rugby seen the boulder. He might be able to help you. [...]". Hutchinson published on Geology of Charnwood Forest (Quarterly Journal). [Sir William Franklin, FRS.] Autograph Letter Signed ('W Franklin') to 'Dr <Marriot?>', regarding the election of William Merry, Deputy Secretary at War, to the Geological Society. 24 Charlotte Streeet, Portland Place [London]. 24 March [no year, but on paper with watermarked date 1807]. 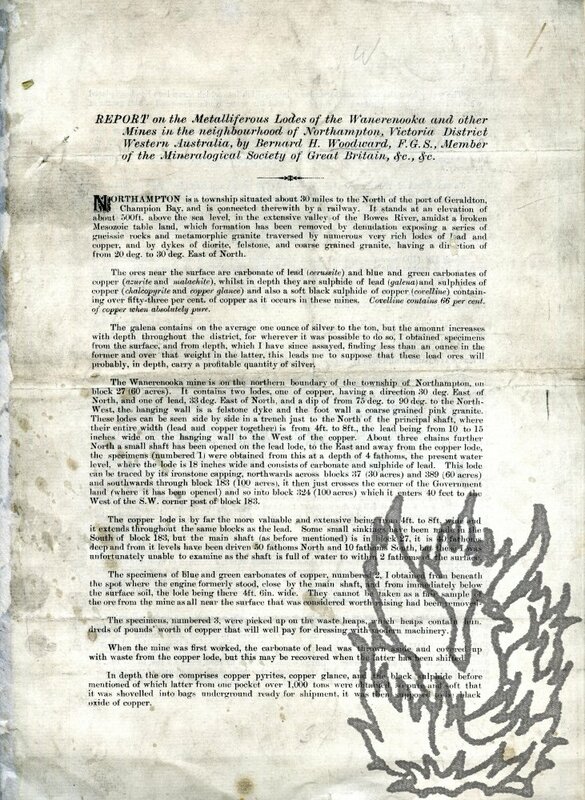 Autograph Letter Signed from Epaphras Hoyt to 'the Commissioners of Canals, in Massachusetts', giving the results of his 'surveys and levels, in the valley of Deerfield River', and discussing the possibility of a tunnel through the Hoosac Mountain. Deerfield, Massachusetts; 20 September 1825. 4pp., 4to. Fair, on lightly-aged paper. An important document, not least for the fact that its author discusses the building of a 'tunnel 4 or 5 miles through the [Hoosac] mountain', anticipating the commencement of the construction of the Hoosac Tunnel by 23 years. 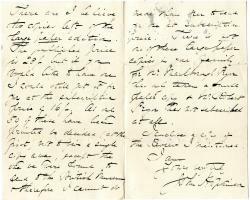 The letter is closely and neatly written, with the first page headed 'The following Results of my surveys and levels, in the valley of Deerfield River, are respectfully submitted to the Commissioners of Canals, in Massachusetts. | Viz. [Printed pamphlet] The Excursionist's Guide to the Neighbourhood of Hereford, containing Itineraries of the Railways and Roads, [...] papers on the Geology of the District, [...] the Flora of Hereford and Ten Miles Round, and a Glossary [...]. 12mo, iv + 56 pp. Stitched in original wraps, printed in red and black on yellow. Text clear and complete. Aged and in worn and faded wraps. 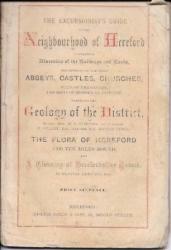 Full title: 'The Excursionist's Guide to the Neighbourhood of Hereford, containing Itineraries of the Railways and Roads, Descriptions of the chief Abbeys, Castles, Churches, Seats of the Gentry, and Spots of Historical Interest, Papers on the Geology of the District, By the Rev. W. S. Symonds, of Pendock, T. Curley, Esq., and the Rev. October 1884, July 1887 and March 1888. 1223 Belmont Avenue, Philadelphia, Pa.
Each catalogue 8vo, 32 pp. Stapled and unbound. The text of all three items clear and complete. On aged and spotted paper. 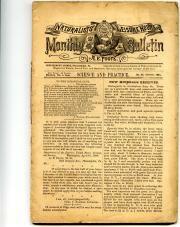 Each issue carries an editorial introduction, with that of October 1884 (no. 85) eight pages long, and boasting that it is 'the most complete catalogue of American Official Geological Reports ever published. The previous lists of Prime and Marsh have been consulted, but very many have been added during the period covered by Prime'. 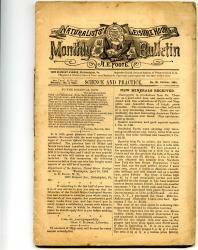 With printed date 'Perth, W.A. [Western Australia], 26th February, 1891.' Map dated by Woodward on the same day. The report is printed on three pages of a bifolium with leaf dimensions roughly 30 x 21 cm. In small print. Both text and plan clear and complete. Both plan and map carry the faint 1 cm accession stamp of the Webster Collection, numbered in manuscript 4899. A scarce piece of Australiana, on grubby and stained paper, archivally repaired and tipped-in to cream paper folder. Describes the situation of the townships and mines, whose yields, both on the surface and at depth, he gives. Autograph Letter Signed to Richard Owen. 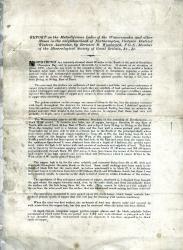 Geological Society | 4 December 1847'. Scottish geologist (1810-79). Sir Richard Owen (1804-92) was a naturalist. One page, 12mo. Very good, though grubby and creased in one corner. 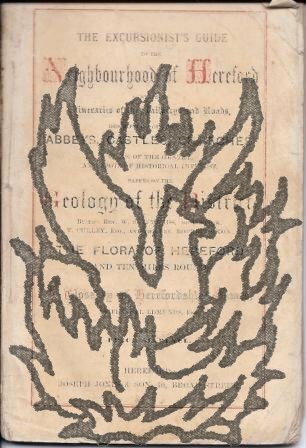 Traces of mount adhering to blank verso. 'I have much pleasure in at length having it in my power to send you a proof of your memoir. It has been far longer delayed than I expected. I send you the press proof as there are a good many connections and queries in the margin'. Signed 'James Nicol'. Note: Perhaps concerning "Memoir of William Clift, F.R.S." (1849). Autograph Letter Signed to Pryor's mother. 5 March 1888; St Albans, Hertfordshire. 12mo: 3 pp. Good, on lightly-aged paper. Concerns Pryor's posthumous 'Flora of Hertfordshire' (1887), which contained an introduction co-written by Hopkinson. Four copies of the book are being presented to Mrs Pryor 'by our Society'. 'This is partly the cause of the delay in sending them to you, for we had to wait for authority from the Council of the Society, to present them.' The rest of the letter concerns the large paper edition of the book, a copy of which Hopkinson offers to procure for Mrs Pryor 'at the subscription price'. Autograph Letter Signed to the English mineralogist and geologist William Phillips (1775-1828). 23 May 1823; Union Place, Regent's Park [London]. 12mo: 2 pp. Very good. Addressed to 'Mr. W. Phillips' on otherwise-blank second leaf of bifolium, which carries traces of previous mount. Acknowledges 'the obliging present' of Phillips's 'valuable work on mineralogy' (the influential 'Outline of the Geology of England and Wales', 1822, written with William Conybeare). 2 November 1848; 4 Hyde Park Gate, Kensington. Scottish geologist (1805-98), Fellow of the Royal Society. Written in capacity as Secretary of the Geological Society. Four pages, 12mo. On grubby, stained paper discoloured with age. 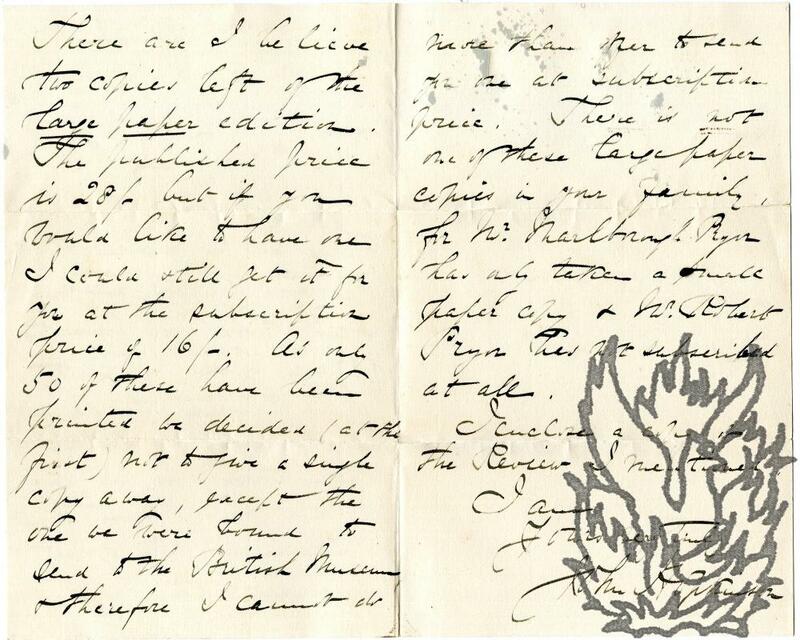 Second leaf of bifoliate attached to two fragments of draft replies in similar condition. 'Your very elaborate Paper on the L[ower]. Greensand Corals came before the Council yesterday for consideration: and the unanimous wish was to print it in the Journal with the fullest illustrations. A Letter to the Right Hon. W. E. Gladstone upon a Land Scheme for Ireland. London: Macmillan and Co. 1881. Octavo: twenty pages. Unbound and stitched. Good, but with outer leaves a little grubby and creased. The word 'rack-rent' on page six has been underlined and three exclamation marks placed beside it in ink. As well as important botanical works, Clarke numbered political economy and education among his interests. 1 January 1867; East Molesey, Kingston, Surrey, on embossed letterhead of the Geological Survey of Great Britain. Two pages, 12mo. Very good, with the merest spotting at head. He 'will be at West Drayton by the train due there nearest to 4 o'clock'. He has no time-table to hand, 'but shall see one at Jermyn St. to-morrow'.